May 26, 2015 by Madeleine D.
The tables are exactly as they appear in the photos. Love the versatility and the mirrors have a nice foam backing on them so they sit nicely in the frames and are sturdy. My client and I are both very pleased with this purchase. 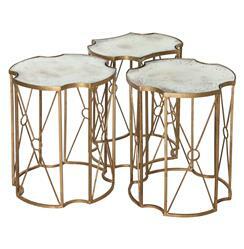 This trio of tables configures into an eclectic coffee table, a large and small side table, or three end tables. Antique gold leafing is hand applied to the metal bases, making each piece unique. Add gilded glamour to your romantic room with this mirrored masterpiece.